Black Baron is on the run. Black Baron is one title in the new Lightning Strikes series from Walker Books, a series aimed at 9 to 14 year old readers, and likely to engage reluctant readers with its contemporary look and non-threatening length. 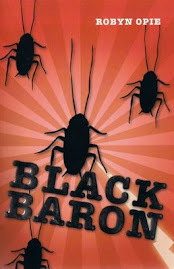 Black Baron is humorous, with chaos ensuing as Jake searches for his cockroach and tries to prevent it being exterminated, but also touches on serious issues such as family conflict and financial stress. The friendship Jake shares with his mates is also a very positive element of this story. A great read for upper primary aged readers. Black Baron by Robyn Opie (Walker Books, pbk, $15) is a fast-paced, short novel for junior readers who are just discovering chapter books. The Baron is the best racing cockroach Jake has had, until his mum discovers it and targets it for extermination. There are a couple of narrow escapes before the bug finds a sort of cockroach heaven. - Raymond Huber is a Dunedin teacher.